Abstract: We often take for granted the standard LCD display, looking first for the ultra thin dimensions primarily, and then investigating other areas. We often take for granted the standard LCD display, looking first for the ultra thin dimensions primarily, and then investigating other areas. Big bulky Cathode Ray Tube monitors have taught us to think that a computer display can only, and should only turn left or right, and tilt up or down. The beauty of the LCD display is that not only does it take up one heck of a lot of less space, but it also offers other freedoms that many of us are honestly not accustomed to. Now part of this will depend on how well the manufacturer has thought things through, and part of this will depend on what kind of LCD display you are considering. Value displays are typically made in once piece and offer only very limited adjustments. A display like the Samsung 191T is a more of a higher end LCD display and this is immediately evident when you look at what the removable stand has to offer. The left and right motions are decidedly poor due to a swivel that is hard to turn, but it can be done with a bit of effort. The back and forwards tilt is there, and most importantly a 2" vertical height adjustment is now possible. Imagine the pain and lifting necessary to move a 19" 52 pound CRT display up or down an inch! Bezels are the area around the screen, the little space people grab on to move and position a monitor, or in my case, the place where hundreds of little yellow Post-It notes go. Personally, we've always felt that the bezel should be as small as possible without making the user actually have to touch the screen; LCD or CRT. Finger prints are annoying and we don't like them anymore than you. The 191T breaks with a lot of tradition because the bezel is only 18mm wide, or about the width of a thumb. Why is this important you ask? Well, it really makes the monitor seem slimmer, and in environments where you want to focus on other things then beige it helps to keep the focus on what is on the screen instead. From the technical standpoint the 191T is very well equipped, eclipsing some similar displays we reviewed just a few weeks ago with a very impressive 500:1 contrast ratio. Although the 191T only has a brightness ratio of 250 nits, it really does look a bit stronger than my 19" ADI display - which is saying quite a lot. With a dot pitch of 0.294mm and ultra wide viewing angles of 170 degrees horizontal and vertical there isn't a whole lot of room to begin criticizing the 191T spec wise. Heck with a resolution of 1280x1024 and a pixel refresh rate of 25ms I practically have to keep the other folks in the PCstats lab at bay with a yard stick. Okay so you are probably thinking, "19" LCD, isn't that kind of an odd size?" For most of the time that LCD displays have been on the market you have been hearing about 18.1" LCD displays which offer a comparable size to that of a 19" CRT (in fact a 17" LCD is just about the same size too, but that is another story). Well someone must have finally realized that it is really much simpler to compete against standard CRT displays head on and offer a 19" LCD size which is bound to be less confusing to consumers. Hint: When comparing LCD displays there are four things to look for. 1) Brightness or Luminance: the specs are listed as 250cd/m² or 250 nits depending on the manufacturer, but basically the higher the number the brighter the display will be. You want the brightest you can find for the best possible picture (250 is very good, 100 is so so). Luminance is based on a logarithmic scale, so small differences in values are not going to be that noticeable. The 191T works off of either an Analog or Digital DVI video cable and will allow you to switch between the two if you are using two different computers for instance. The recent trend in LCD displays has them migrating to thinner and thinner bezels in a bid to appear ultra slim. The lowered profile removes those big bulky buttons from the 191T and replaces them with a thin line of silver keys. In normally lit office environments these keys are easy to see, but in darker rooms it can be difficult to read the icons which are not back lit. It's not a big deal by any means, as I'm sure a row of green glowing words below your display would just be ultra distracting. 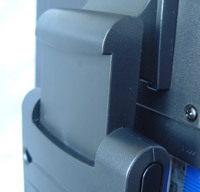 The stand also incorporates spaced for a rear mounted, and completely optional USB Hub, and can be removed for mounting with a 100VESA compliant armature. Up next, we take a look at the 191T from a few different sides, and see how this 19" screen rotates to accommodate larger page areas.